This week I did a rather large hammertoe surgery. 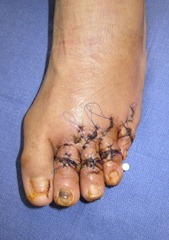 Additionally, I did another large hammertoe surgery on the same patient just six weeks prior on his other foot. 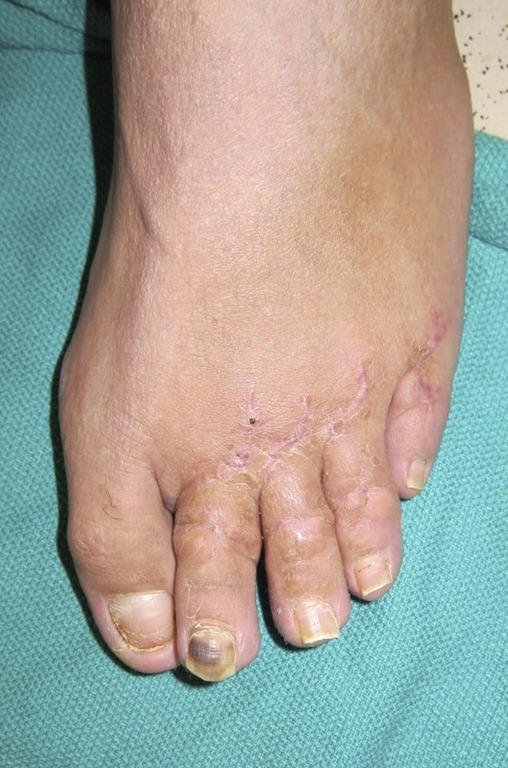 What do I consider a large hammertoe surgery versus a regular hammertoe surgery? This patient had some of the most severe hammertoes that I have ever operated on. All eight of his toes, other than the great toes, were severely contracted. They were virtually dislocated at the metatarsal joint at 90 degree angles to the foot. The toe joints were dislocated in the opposite direction at 90 degrees and the second toe joints were in the opposite direction to that! Before I tell you more about the surgery and show you before and after pictures of this hammertoe surgery, let me tell you one amazing thing. The day of the second surgery, six weeks to the day after the first surgery, my patient informed me that he was playing basketball and comfortable the very day before. Of course, I had told him it would be 12 weeks before he could play so he was not really listening to me, but I was happy he was doing so well after his surgery to recover so quickly. This surgery was a big one as far as hammertoe surgery goes and he needed it on both feet. It was big because he required release and lengthening of 8 metatarsal phalangeal joints, 8 toe joints, 6 screws and 2 pins. Let’s start at the beginning. If you want to skip ahead, scroll down and check out the before and after pictures of hammertoe surgery at the end. This patient came to me with a complaint of pain in both feet at the toes due to the contracted joints. He had pain with any activity and just walking. He had trouble fitting shoes. He also didn’t like how they looked, and was embarrassed. 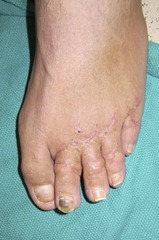 On physical exam he had rigidly contracted toes and dislocated joints. X-rays confirmed severe hammertoes and joint dislocations. I told him all about the surgery to correct hammertoes and the postoperative course. In surgery, I first opened up the to the toe joints and cut with a saw across the toe bones to shorten the toe and reduce the contracture of the toe joints. I then removed the cartilage of the adjacent bones in order to allow the two bones to fuse together when they heal and form one bone. This is necessary to achieve a very stable straight toe so that hammertoes will not come back again in the future after surgery. People are always concerned when I talk about fusing bones and joints together as to what the future function will be. I describe it like this: The joints at the ball of the foot still function up and down. These are the important motions when walking, running and performing all activity. The toe joints do not need to move. The toes are against the floor when you’re walking and running, etc. such that they do not bend anyway. The tendons still function to hold he toe against the ground but not bend into the ground. So, fusing the toe joints to never move again does not affect most activities going forward. It would be difficult to grasp with the toes like picking something up, but that’s not a usual activity for most of us. Going back to the hammertoe surgery procedure, after I cut the bone and remove the cartilage in order to get the bones to fuse together, I then need to put in hardware to hold the bones in the proper place and position. There are multiple choices of hardware. 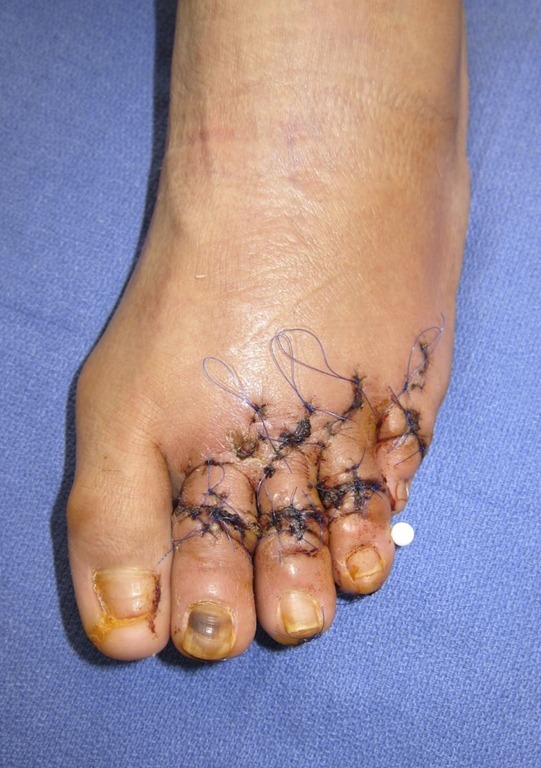 The old way to fixate hammertoes in surgery was to use pins called k-wires. While I occasionally do use these, they are not my first choice usually. K-wires hold the bones together in only one plane from angulating. The bones can still move from proximal to distal (close to far) on the pin which we refer to with an analogy of ‘food on a shishkabob’. It can move along the metal pin. It can also rotate on the pin. New advancements in surgical fixation use metallic implants that are inserted into the bones to more rigidly hold them in place. These implants usually screw into one bone and are force fitted into the adjacent bone with barb-like structures. This prevents the bones from moving and rotating. I often use these but they are very expensive and do not hold as well as screws do. Often, my fixation of choice are screws. Screws are unique in that they cause compression of the two bones to be fused together in order to hold them tightly together. This also stops angulation, and all other motion. I have found the greatest success rate of achieving fusion using screws compared to any other fixation. So, by this time in the surgery, I’ve prepared the bones to fuse and then need to insert the screws. The special screws are called cannulated screws. The have a ‘cannula’, or hole down the center. This allows me to insert a temporary metal wire into the bones to hold them straight and to make sure I like the position before permanently fixing them. Once I put the pins in and confirm I like the positioning with real-time x-rays, the screw slides onto the wire with the hole down the center. I screw the bones together and then remove the temporary wire leaving just the screw holding the bones together. You can see the screws on x-ray in the post-operative photos below. Depending on the size of the bones I use different diameters and lengths of screws. Believe it or not, it is hard to find screws that are long enough for fusing toe bones. The problem in the past was that companies made shorter screws of the thinner diameters that did not allow for fusion of toes. The reason for this is that when fusing larger bones, we use thicker screws. There was no need for long thin screws. Fortunately, I was able to work with one of the screw companies in order to design special screws for the purpose of fusing hammertoes. This company makes screws that are longer than any other company. (Thanks Perry). If any doctors reading this want the name of the screw company, feel free to email me and I’ll let you know how to get these screws. On the little toes, fifth digits, the bones are too small to safely insert screws without risk of fracturing the toes usually. For this reason, I usually do not use screws in the small bones but opt for k-wire fixation. I also do not fuse these bones but rather just take out part of the joint to shorten and straighten the toe. 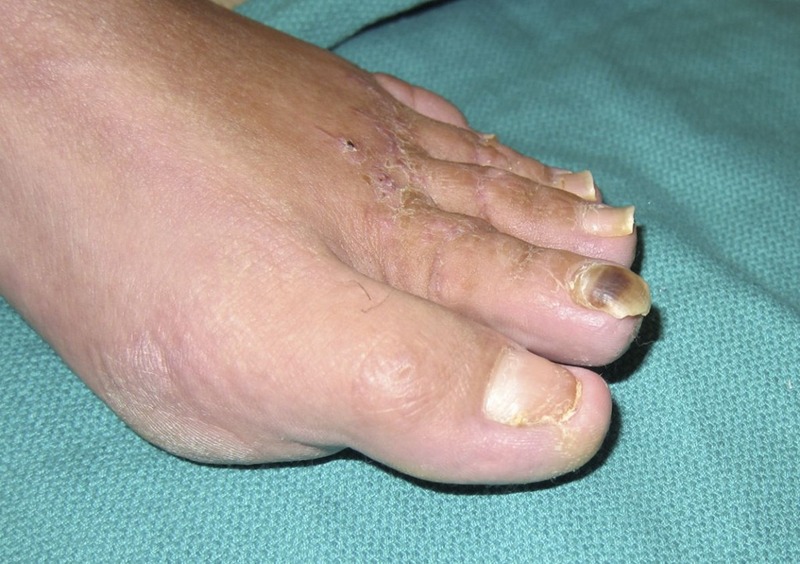 On some smaller patients this applies to the other toes too, not just the fifth toe. Once the screws and pins are in and the toes are straight, I next address the base of the toe joint that is dislocated. I make another incision further back to access the next joint back. This is called the metatarsal phalangeal joint. I lengthen the tendon that moves the toe up called the extensor digitorum longus tendon. This is an important step as this tendon has become permanently shortened over time, and that holds the toe upwards. I use a procedure called a Z-lengthening because the incision through the tendon is shaped like the letter Z. This allows the tendon to still function in a longer position after the toe is brought down. Next I go deeper to the joint capsule and perform a lengthening and release to bring the toe down from it’s upwardly contracted position. At this time the toe is straight and the contractures are lengthened. The toe is shorter and in a perfect position. This is a really rewarding surgery for me. I take a severely deformed toe and turn it into a better looking and better functioning toe. It took me just over two hours to do each foot, 4 toes including lots of plastic surgery maneuvers of the skin. Most doctors would stop with straight toes but I have additional training in plastic surgery skin plasty procedures that I have written about on my blog before. Imagine what happens when you shorten the bones drastically of these hammertoes. There is lots and lots of redundant skin and soft tissues left over. A big part of this surgery is obtaining a nice cosmetic outcome, as well as reducing pain and improving shoe fit. In order to obtain a cosmetic foot surgery outcome, I spend a great deal of time working on the soft tissues, skin and suturing technique. First I shorten all the tendons and joint capsules that are redundant after the bones are shortened and suture them. Next, I address the skin, in order to shorten the redundant excess. This involves a series of skin plasty procedures. I perform diamond shaped incisions to remove excess skin. I then perform additional smaller diamond shaped incisions at 90 degree angels to each other until the excess skin is gone and the toe is round again. Even with all this plastic surgery type procedures, occasionally patients end up with small areas of excess skin postoperatively after the scar tissue forms. For this reason, I always inform patients that I can perform additional surgery nine to twelve months later, or more, to remove the excess skin in an additional surgery. Ok, so to summarize: I’ve removed and shortened the bones. I’ve straightened the toes. I’ve permanently fused the bones with screws holding them together. I’ve reduced the soft tissue contractures at the further back joints. I’ve shorted the tendons and joint capsules. I’ve done plastic surgery skin plasty procedures for a cosmetic outcome and I’ve sutured everything with cosmetic surgery techniques. You can see the drastic reduction of the hammertoes in the before and after photos. I always call my patients the next day after surgery. After both of these surgeries, I had expected this patient to have some post procedure pain, but was very surprised both times when he told me he had virtually no pain and took only one or two Vicodin. As usual, thanks for reading and please submit comments and questions. Although I’m behind in answering them, I’ll eventually get to them all. Pre-op hammertoes surgery Immediately post op hammertoes while still in surgery. Two and a half weeks after hammertoe surgery. 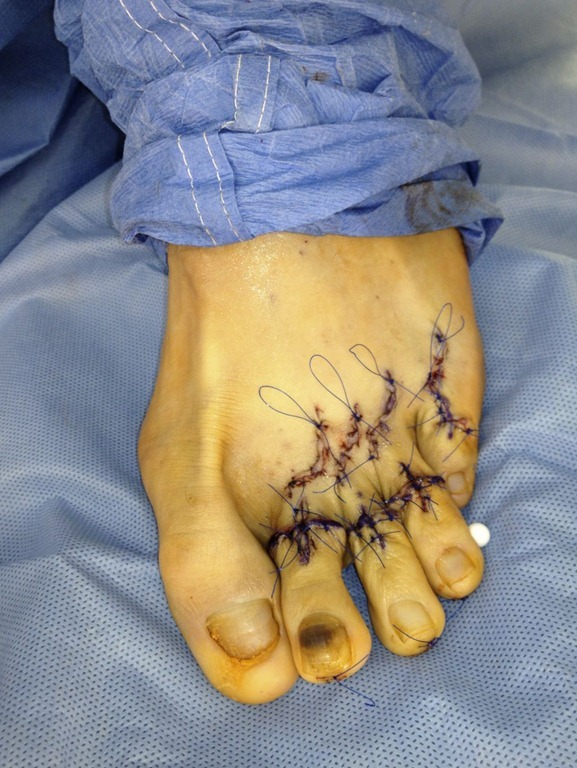 Pre-op Hammertoe surgery Immediately post op hammertoes while still in surgery. I am scheduled for hammertoe surgery and would like a second opinion ..when do you do the minimal surgery only on tendons(sof tissue) not bone? I was told that if your toe cannot be straightened when I try to push it into place than I need more traditional bone surgery ..is this true? Yes this sounds true. If the deformity is rigid such that you cannot straighten the toe by hand, it definitely requires bone work. Even if you can straighten it by hand, it often requires bone work as well to fix the problem and prevents recurrence. Sometimes you can perform just soft tissue work to fix hammertoes but only in mild, flexible situations. I have hammertoes due to shoes and long hours of work over 65 hours per week. Let me start with: “if t sounds too good to be true it usually is”! I occasionally do this tendon only repair for hammertoes. It only works in situations where there are minor hammer toes and they are flexible. Flexible means that I can easily straighten the toes out by hand completely and they are not rigidly contracted. Assuming your hammertoes fall under that description, the recovery for this type of surgery is much longer than you describe. First of all, taking the stitches out three days after surgery is not advised. It takes longer the the skin to heal. I almost always leave the stitches in 12-19 days. Theoretically, you could eave the stitches in longer and still return to activity. However, going back to a job that requires you to stand is not advised at four days. The absolute minimum would be 7-10 days I would recommend for my patients. 10-14 days would be better. Even then, you should expect some pain and swelling. I had bunion removal and toe shortening 5 years ago and you are absolutely correct and the only doctor I have seen that addresses the excess skin problem. That is the one thing people comment on is how the excess skin along with some other issues post op has created make my toes look like they have arthritis. The additional problems I ended up with due to the surgery not turning out well were as follows. All four of my toes are crooked and curl towards my big toes. Also, the toes going towards my big toe has created tailor’s bunions that hurt. A screw was put in my big toe on my right foot that hurts off and on. My questions are how bad would it be on my feet to have an additional surgery to correct these problems? 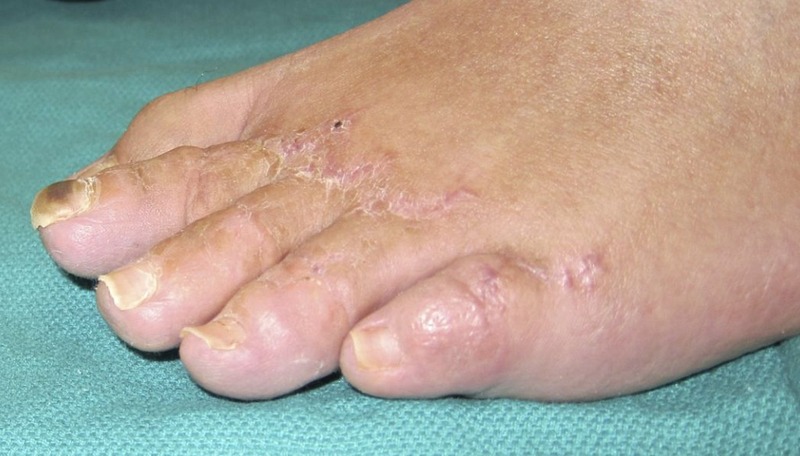 I notice the removing of excess skin involves sutures on top of your feet and how much scarring is involved as I thought the whole idea of sutures on the side was to avoid visible scars? Last year I had bunion and hammertoe surgery on my left foot. One surgery ended up turning into 3 surgeries and I am still in need of a 4th surgery. One of my toes has a pin in it that is too short and sticking up and one of my other toe has a tendon that is making the toe droop. I am hoping that you can tell me of a surgeron in the Chicagoland area that you would highly recommend. I no longer have faith in the surgeron that performed the other surgeries. Thank you.